Watermelon—Sugar Baby Watermelon are compact, dark skinned, and known for being heavenly sweet. Enjoy! Cantaloupe are coming soon. Sungold cherry tomatoes—We harvested enough for all shares to receive a pint this week. Green tomatoes— We’re baffled that our large, healthy crop of tomatoes isn’t maturing into an abundance of red fruits yet, but our fingers are still crossed that they’ll kick in soon. We’re sick of waiting for them to ripen, so we figured, let’s at least go ahead and get you all some green ‘maters. There’s a chance that the choice to do a large harvest of green tomatoes will prompt the plants to hasten ripening of the remaining fruits left on the vine, but there ALSO a chance that this harvest will delay maturation. We really aren’t sure, but we took a risk since we weren’t getting hardly any ripe tomatoes anyway. We’ll see what happens! Eggplant—Large shares received our Italian Eggplant, and small shares received either Fairytale Eggplant or long, slender Japanese eggplant once again. These little eggplant don’t store very long, so wrap them up in a plastic bag and put them in the fridge so they keep for a few more days. For the best flavor and texture, cook your eggplant at fairly high heat until slightly browned or very lightly charred. You can get this effect by either roasting it in the oven around 425, grilling it, or blistering it in a nice hot cast iron pan on the stove. Then we toss it into our pasta/curry/etc. Cucumbers—Still going strong! 2 types for each share this week- slicing, and English seedless. Try our recipe of fridge pickles. Onion—large yellow onions for all, and more where that came from! Sweet Italian Peppers—Small shares received these longer, slender peppers. They’re wonderful raw, nice and mild. Chop them into a cucumber sungold salad with a bit of feta. They’re also really great fried, they really sweeten up. Bell Peppers—A nice handful of colorful bells to all the large shares. A quick note: as the weather warms, the fruits get smaller and smaller, so expect mini size till the weather cools in fall! Yellow squash—Large shares received a nice supply of tender squash this week. 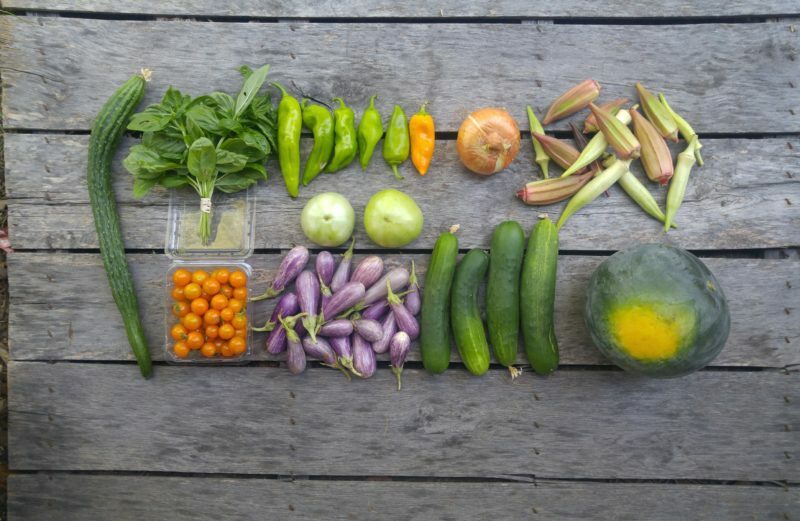 Okra—Everyone received a mixed bag of our 4 varieties of heirloom okra. They’re just beginning to come into peak production, so we should have lots more for you soon! Basil—lovely little bunches of fragrant, tender basil. Trim the stems and store in a glass of water on the counter, not in the fridge. Onions, potatoes, peaches, and tomatoes will all prefer to stay at room temp. Tomatoes especially will begin to get mealy if stored any colder than 55 degrees. The cucumbers, peppers, and eggplant like to be cool but not cold. They can be stored at room temp if you’ll be eating them in a couple of days, otherwise put them sealed up in the fridge if you won’t be getting to them for a few days. They last quite a long while in the fridge. Everything will need a gentle washing before cooking, but leave the dirt on until you’re ready to use them to prevent faster spoilage. 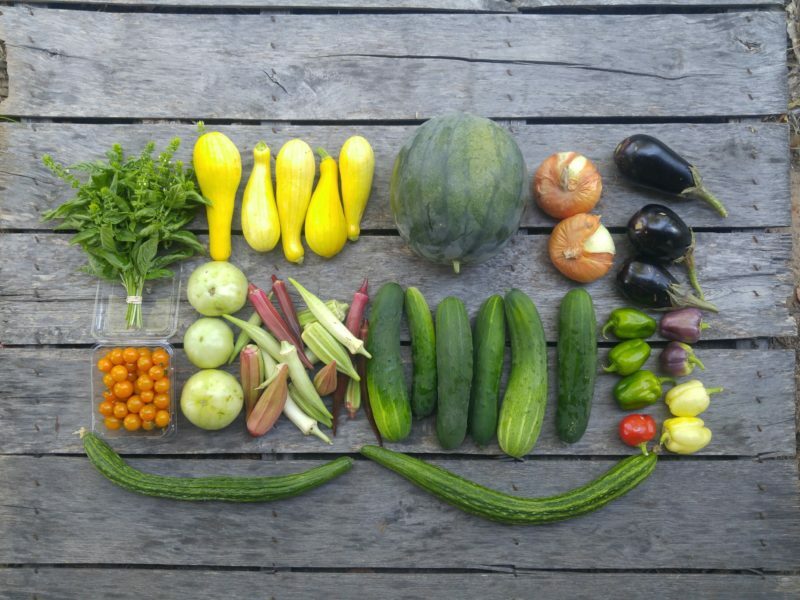 Large share from top left: Basil, yellow squash, Sugar Baby Watermelon, yellow onion, Italian Eggplant, (second row) sungolds, green tomatoes, okra, slicing cucumbers, colorful bell peppers, and English Cucumbers across the bottom. Small share from top left: English Cucumber, basil, Italian Pepper, onion, okra, (second row) sungolds, green tomatoes, Fairytale Eggplant, slicing cucumbers, and Sugar Baby Watermelon.